WASHINGTON – In a 29-page indictment Friday, special counsel Robert Mueller III blamed specific officers in the Russian government for the 2016 hacking of Democrats, answering one of his investigation's central questions while highlighting another he must still explain: Were any Americans involved in the conspiracy to interfere in the race for the White House? As Mueller faces the task of resolving that piece of his inquiry – as well as his examination of whether President Donald Trump has sought to obstruct the probe – people familiar with the investigation said the special counsel is pushing to wrap up a significant portion of his investigative work by the end of summer. There are various factors that could alter Mueller's efforts and timeline, most notably whether the standoff over an interview with Trump is resolved or ends up being litigated in court, according to the people, who requested anonymity to discuss an ongoing investigation. As recently as this week, Mueller's team has discussed interviewing more witnesses, a sign that a part of the probe remains very active, a person familiar with the matter said. Mueller has discussed scenarios for winding down at least some of his office's work in the coming months, the people said, emphasizing that the special counsel views his primary responsibility to be investigating – not necessarily prosecuting – any wrongdoing linked to the Russian interference efforts. Since his May 2017 appointment, Mueller has charged 32 people, including 26 Russians. Grand jury indictments have laid out detailed allegations of how Russia sought to manipulate Americans through social media, break into state voting systems and hack the email accounts of Democratic committees and party leaders. The special counsel has yet to offer any conclusions about whether Trump or his associates worked in concert with the Russians, a question he was tasked to examine. Former federal prosecutors noted that investigators often approach a case as if it has the concentric circles of a target – starting with the larger circles and moving inward. "It's standard practice to start at the outside of the misconduct and work towards the center," said David Kris, who oversaw national security matters at the Justice Department in the Obama administration. "Depending on what other evidence Mueller has, it might start to look like the walls are starting to close in on the president and his closest associates." In announcing the latest indictment Friday, Deputy Attorney General Rod Rosenstein noted that no Americans have been charged with assisting the Russian interference and urged the public not to make assumptions about that part of the investigation. "In our justice system, everyone who's charged with a crime is presumed innocent unless and until proven guilty. It should go without saying that people who are not charged with a crime also are presumed innocent," Rosenstein said. 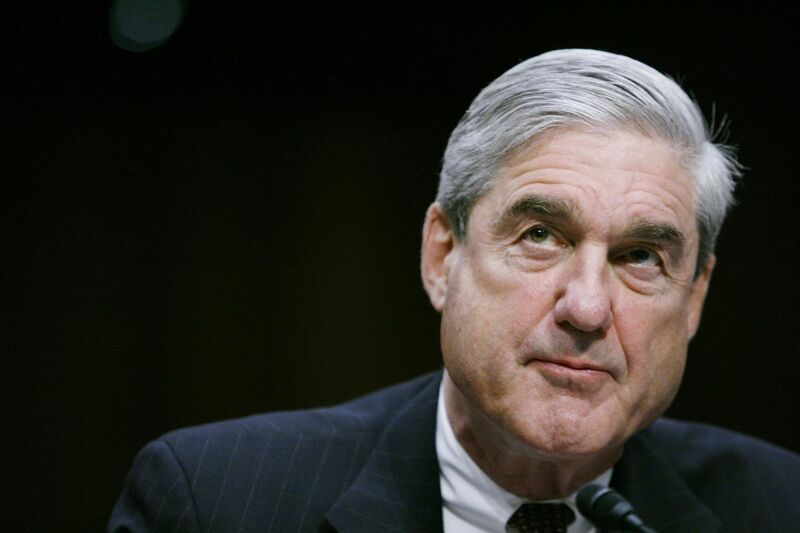 As the probe has spilled over into a second year, Mueller has come under intense political pressure to bring it to a close – much of it directly from the president, who has repeatedly denied wrongdoing and argued there is no evidence of "collusion." On Friday, hours before Rosenstein announced the indictment in Washington, Trump – who had been briefed that the charges were coming – again called the investigation "a rigged witch hunt" during a news conference in England. Trump's attacks on the probe come as the special counsel has been investigating whether he has sought to thwart the investigation. For months, Mueller has been seeking to interview the president. Members of Trump's inner circle and legal team said they see signals that Mueller may want to avoid a lengthy subpoena battle for Trump's testimony to wrap up his obstruction report and Russian interference probe. In March, Mueller had raised the possible threat of subpoenaing the president in a meeting with Trump's lawyers, but Trump attorney Rudy Giuliani said in an interview Friday evening that Mueller has not raised it since then. The Mueller investigators and Trump legal team have been at an impasse about the interview since that March meeting, with the president's side more recently demanding specific conditions and putting central topics off-limits, Giuliani said. Among them: that Mueller not ask any questions about actions Trump has taken as president, including his private discussions with then-FBI Director James Comey. Giuliani said Trump does not recall asking Comey to drop an investigation into former national security adviser Michael Flynn and he does not want the president to be accused of lying about the episode. "The president firmly believes he didn't say it," Giuliani said. "He doesn't recall it . . . But Mueller could come out the other way," he added. "They'll say he's lying. We don't want to expose him to perjury [accusations]." Trump's lawyers – who expect their interview terms will be dealbreakers for Mueller – have not yet gotten any response from the special counsel or his deputies. "We don't expect Mueller would agree," said one person briefed on the discussions. "But if he did, well, then we'd face a really interesting choice." Despite the impasse, Trump attorney Jane Raskin continues to regularly negotiate with Mueller's deputy, Jim Quarles, over the possible setting of the interview, including the time, place and setting, according to people familiar with her role. Meanwhile, inside the Justice Department, law enforcement officials have discussed several scenarios in which the prosecutions of people who may be charged as a result of Mueller's investigation are farmed out to other offices to handle any future trials. In those scenarios, these people said, some prosecutors on Mueller's team could move with their cases to Justice Department headquarters or individual U.S. attorney offices, these people said. The transferring of some cases has already begun. Last month, a new group of Justice Department prosecutors were assigned to a previously filed case of Russian people and companies accused of using fake social media accounts to try to influence American voters in 2016. At the time, people familiar with the probe said the new prosecutors were being brought on board because the case would probably be turned over to the federal prosecutor's office in Washington. On Friday, when a grand jury working with Mueller's office indicted 12 Russian military officers, Rosenstein said the case would be handled by prosecutors at Justice Department headquarters. There are practical reasons for Mueller to hand those cases over to other prosecutors – collectively, they involve charges against 25 Russian citizens who are unlikely to be arrested and extradited, so the indictments could linger as open cases for years. Law enforcement officials have discussed similar transfers of other matters that Mueller is investigating, according to two people familiar with those discussions. There have been other public indications that some areas under investigation are nearing their end. Sentencing dates have been set for two people who pleaded guilty to charges and cooperated with the probe: former Trump foreign policy adviser George Papadopolous and Richard Pinedo, a California man charged with a Russian Internet trolling operation. In one key case, however, Mueller has signaled that he intends to do more work. Prosecutors have twice asked to postpone the sentencing for Flynn, who pleaded guilty seven months ago to lying to the FBI. He was back in court last week, reiterating his cooperation. Prosecutors have offered to update the judge in that case on Aug. 24. Friday's Russian hacking indictment revealed an astonishing level of detail, which means that intelligence and law enforcement officials were prepared to expose valuable sources and methods to make a public case, said Aloke Chakravarty, a former Justice Department attorney who prosecuted the Boston Marathon bombing. "If they can do that in a way they can prove beyond reasonable doubt, it opens up all the connections that a conspiracy might have: the facilitators, the aiders and abettors," he said, adding that the indictment could be used as a springboard to bring other conspiracy charges later. The indictment did not name or charge WikiLeaks, the anti-secrecy group led by Julian Assange, which published thousands of Democratic emails just before the party's 2016 nominating convention. The document did, however, charge that Russian intelligence officers, using a fake online persona called Guccifer 2.0, discussed the release with WikiLeaks beforehand. Barry Pollack, a lawyer for Julian Assange, the organization's founder, said the conduct it described – soliciting sources for information and publishing it – was akin to how any news outlet might act. "The description of the actions of Organization 1 in the indictment is identical to how one would describe any journalistic organization," Pollack said.